How do I put a Scoreboard at the top of my Team Website? To create your custom scoreboard, your first must Register your device. This is done from the Admin Website under the Account tab. 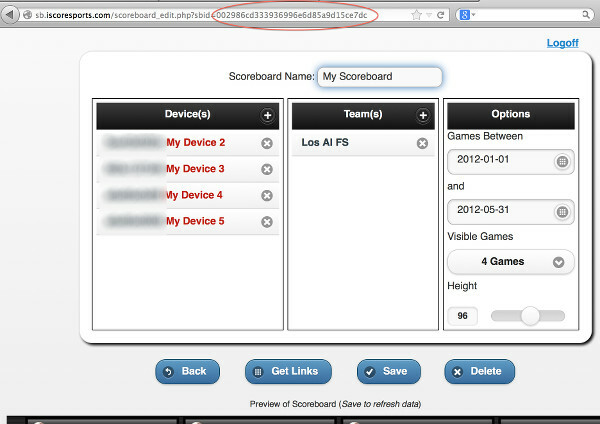 Create your Custom Scoreboard from the Scoreboards link in the upper right corner of the Admin Website. Once you have created the scoreboard you want to appear, note the sbid= value in the URL of the scoreboard editor screen (circled in the screenshot to the right). Now log in to your Team Website with the Admin password for your site, and go to the Settings tab. Scroll down to the Scoreboard section, and copy just the sbid= value (the value to the right of the = sign) into the SBID box on the Settings screen and then click Save. Your custom scoreboard will now appear at the top of your Team Website.